First big fundraiser of the year…. 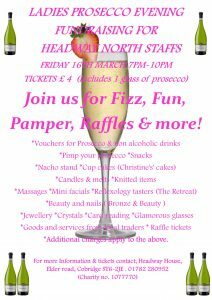 Join us for Fizz, Fun, Pamper, Raffles & more! *Additional charges apply to the above. A fantastic fun night starting at just £4 per ticket grab ’em while you can ladies!! Headway North Staffordshire (Head Injuries Association) Ltd is a Registered Charity No. 1077770 and a Company Limited by Guarantee Registered in England No. 3758806. Affiliated to Headway, The Brain Injury Association.